Q: Steven, could you just clarify exactly what a "healing crisis" is real quick for the newbies? A: A healing crisis is very much like an acute bout of cold or flu. It sometimes happens when you switch from eating junk food and not taking care of yourself to eating better and feeding your body better. processed by the liver and removed from the body, generally by the colon or kidneys. As long as this process is done gradually, you usually won't get a dramatic healing crisis. However, if one goes from eating a typical American diet to eating a bunch of raw fruits and vegetables, they will almost always experience a healing crisis within one to three days. This can also happen when one takes supplements that start to strengthen metabolic or glandular processes. crisis. Cleansing herbs stimulate discharge, so you're just experiencing the effect of the herb and possibly taking too much. On the other hand, if you start taking GreenZone and after a few days have a bout of nausea, that's probably a healing crisis. A healing crisis happens when your liver, colon and kidneys can't handle the load of toxins being released. It may be due to a problem with phase two detoxification in the liver. As toxins are processed through phase one enzymes, they actually become temporarily more toxic. If your phase two system are sluggish and can't keep up, you'll feel sick. When this happens, you may feel a little weak, dizzy, lightheaded or get a mild headache. You may also get symptoms of discharge sinus drainage, swollen lymph nodes, congestion in the chest, a little nausea or diarrhea, a skin eruption, or in rare cases vomiting. These symptoms indicate a need to slow down a little on whatever you're doing and concentrate on helping the body flush what's irritating it. Make sure your eliminative channels are working properly. Drink plenty of fluids and take whatever herbs are necessary to help your body flush whatever is irritating it. If symptoms are intestinal, fiber is very helpful. For skin symptoms, drawing or sweat baths are useful. For respiratory congestion, decongestants and expectorants like ALJ may help. Lymphatic moving herbs are sometimes useful, too. your system out of balance somehow. I would not classify symptoms such as increased blood pressure, severe drops in blood pressure, rapid heart beat, heart palpitations, nervousness, anxiety, insomnia, depression, severe fatigue (past 24-48 hours) or edema as a healing crisis. These are signs the metabolism is out of balance and a person's program isn't working right. I'm actually going to talk about this in my presentation for Leader's Conference. P.S. I only refer customers and clients to companies & products that I honestly and truely think are outstanding!!! Join the different NSP Forums to learn all you can, about All Natural Health, through other Nature's Sunshine members. Visit www.herbsplus4health.com/info_yahoogroups.html for more information. Who is attending this years Leaders Convention in Costa Mesa, California, February 8-11? Who wants to attend and can't? Either way... You may want to jump on these specials so you can enjoy these classes and share them with friends and family. If you are still wasting time counting calories or carbohydrates, it is time to get the “whole” picture. The best way to slim down may just be to fill up… on the right kinds of whole foods that can help you curb those cravings for good. A whole foods diet, along with vitamin supplementation and exercise is part of the Fitter Firmer Faster (Health Communications Inc.) program developed by Ivy and her husband, Dr. Andrew Larson. The new book is a follow-up to the best-selling Gold Coast Cure, which was published in 2005. And if anyone knows what a tremendous difference this healthy approach to weight loss can make, it is Ivy. More than eight years ago, this fitness instructor from Jupiter, Fla., was diagnosed with multiple sclerosis. Her symptoms included bladder urgency, loss of strength and depression. When Ivy was desperate for a miracle, her neurologist put her on a special diet known as the Swank Diet. Since the Swank Diet was bland and hard to follow, Ivy and her husband (then in medical school) put their heads together to make some modifications. The result was the healthy eating plan outlined in their books. Today, Ivy is a walking miracle. She has been able to return to vibrant health without taking any medication. The doting mother attributes her awe-inspiring success to the program outlined in the Fitter Firmer Faster book. But this remarkable 3-pronged approach isn’t only useful for fighting diseases, it can help you get a killer body, too. According to Ivy, eating wholesome, balanced foods can actually cause a person’s appetite to self-regulate. Now, in this eDiets exclusive, she shares 10 foods that can help you curb your cravings. In spite of what you may have read in other diet books, Ivy says, all fruits and vegetables are helpful for weight loss. In fact, fruits and vegetables are at the top of the Fitter Firmer Faster food list. These superstar foods are rich in nutrients, low in calories and packed with fiber. Get the whole truth. Ivy says that whole grains retain the nutrient-rich germ, which is no longer present in refined grains or flour. This means that whole grains are a great source of antioxidants, vitamins, minerals and essential fats. Many studies have also linked whole-grain consumption to proper weight management. Bean there, done that. According to Ivy, beans and legumes provide the “maximum nutritional bang for the minimum calorie buck.” That’s because the foods in this group are packed with protein, fiber, iron, potassium and folate. You say “poh-tah-to,” I say good for weight loss. Despite the bad rap potatoes have gotten in the press, Ivy says, they provide a “strong nutritional punch in a relatively low-calorie package.” Potatoes actually contain lots of healthy nutrients such as vitamin C, iron, B vitamins and phytonutrients. Just be careful what you top them with! Oh say, can you soy? Eating soy can help you lose weight, because it is full of nutrients but low in calories. Soy foods such as edamame beans and soy beans also have the added advantage of being rich in fiber. Just the flax, ma’am. Flax is actually a great source of omega-3 fat. According to Ivy, flaxseeds and flax oils are digested slowly, so they can keep you feeling full for hours. She also says that flaxseeds offer an added bonus for weight loss, since they are rich and filling in fiber. Nuts about weight loss? Walnuts and pumpkin seeds are great sources of omega-3 fats. Other nuts such as almonds, cashews, chestnuts, hazelnuts, pecans, walnuts and peanuts are packed with monounsaturated fats. Ivy says that yogurts and other cultured dairy products like kefir contain more nutrition than milk. Yogurt is also a great source of calcium. Try YoBaby and Stonyfield Farm brands for less sugar and better wholesome taste. Eggs-actly what you need to lose weight. Eggs are full of healthy nutrients, such as B vitamins, zinc, vitamins A & D, iron and the antioxidant lutein. Fitter Firmer Faster is really three books in one. The health-conscious couple has made their approach easier than ever to follow by adding a detailed exercise program and more than 50 delicious recipes. More about the book Fitter Firmer Faster, click here. I found this great information in the eDiets newsletter. CLASSES BEGIN TOMORROW~ JANUARY 13TH!!! DON'T MISS THIS WONDERFUL CLASS!!! SIGN UP TODAY!!! Come Uncover the Mysteries of Traditional Chinese Medicine!!! THE UNTOLD TRUTH SEMINAR reveals what you don't know about certain diseases and teaches you how to prevent or even possibly reverse the damage they do. After the seminar, continue your education with the excellent learning tools you received. Our tools were created by some of the leading medical and nutritional professionals in America today. They contain cutting-edge, research-based information on each health topic and highlight natural and safe solutions for these concerns. You will receive a resource CD to help you share what you learned with others. You'll also take home a booklet, CD and brochure for each of the four topics. 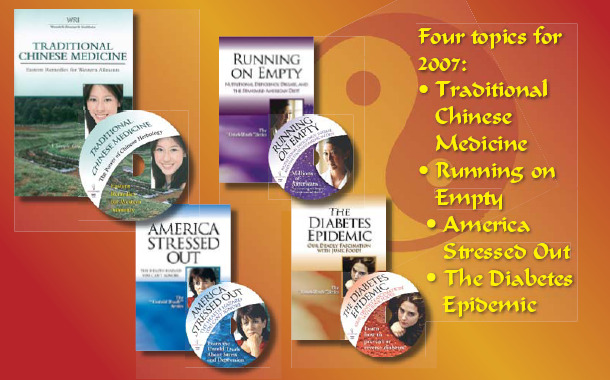 Traditional Chinese Medicine: Eastern Remedies for Western Ailments. Running on Empty: Nutritional Deficiency, Disease and the Standard American Diet. The Diabetes Epidemic: Our Deadly Facination with Junk Food! America Stressed Out: The Health Hazard You Can't Ignore. COST: $20 per person if pre-registered. Interested in carpooling or convoying from Charlotte to Columbia? Call me 704-588-7638 or my mobile 704-458-5475 so we can arrange a meeting place. REGISTRATION: Nature's Sunshine Members can Call NSP customer service to sign up for the class. Non-members please call me to register. 704-588-7638 (Karen). Please leave a message at extension #1 if I am with a client and I will call you back. NSP Members: If you would like to invite friends, family and co-workers to this class you can call home office customer service to sign them up to attend with you. You are also welcome to forward this email on to anyone who would be interested. In addition, email invitations are available on the NSP official site. Call or email me if you would like more help with this. DON'T LIVE IN THE COLUMBIA, SC AREA? Here are some other upcoming Untold Truth classes you could attend as well. Join us and increase your understanding of herbs. It's time to learn the Untold truth about your health! I hope all of you are doing well and are ready to begin a new year! We are excited to kick off the first NSP Product Focus Call for 2007 and what better topic than that of WEIGHT LOSS! I know I packed on at least eight pounds during the last two months…I guess that’s why they want me to host this call! Mark your calendars for January 10th. NSP is excited to have Shirley Piccarreto be our guest speaker. As you can see from her experience she truly “walks the talk” and has dedicated much of her life to this very topic. You do not want to miss this call! We have a new format for asking question…we ask that you submit your questions in advance by clicking on the following link: http://survey.natr.com/survey/us_focuscall.htm We will do all we can to address each and every question that pertains to our product focus. We thank all of you from the bottom of our hearts for your dedication to Nature’s Sunshine and the tremendous impact that you have on the lives of others! Thanks for all you do!!! Join us EVERY MONTH FOR Free Herbal Training via Teleconference Call. Submit your topic related questions to our guest speaker. Former aerobic instructor, personal trainer & Miss Monroe County 1986 (body building) Lightweight division, 1st place. At the scheduled time dial our Focus Call number, 1-800-432-6383, and enter PIN 8626#. March 14 - Enzyme Products discused: Food Enzymes, Proactazyme Plus, Papaya Mint, Nattozimes Plus, Digestive Bitters TonicNote: Topics subject to change. Silver, the once forgotten trace mineral, comes to light in modern-day health science. It is now available in colloidal form: submicroscopic silver particles held in suspension of pure deionized water by a tiny electric charge placed on each particle. We get silver along with all other minerals in our bodies through the food we eat. This comes directly from organic soil. This soil is rich in living organisms. These organisms break down the soil so plants are provided minerals in a form assimilable to the plant. Hence, we get silver naturally from the minerals present in organically grown plants. If we eat plants that have been grown on chemical fertilizers, as most plants are grown today, without living organisms in the soil to help provide nutrition to the plant, we do not get the quantity of vitamins and minerals which are available in organically grown foods. Thus, deficiencies develop. As the tissues age, or, if we cannot assimilate silver for some reason, we develop a silver deficiency and an impaired immune system that can lead to cancer and other diseases. Some suspect a silver deficiency is possibly one of the main reasons cancer exists and is increasing at such a rapid rate today. Dr. Robert Becker noticed a correlation between low silver levels and sickness. People who had low silver levels were frequently sick, had innumerable colds, flu, fevers and other sicknesses. He said he believed a silver deficiency was the reason for the improper functions of the immune system. He found that silver works on a wide range of bacteria, virus and fungi without any side effects or damage to the cells of the body, and can stimulate major growth of injured tissues. Colloidal Silver is the most usable form of the most effective bacteria, germ, virus, and fungal killers known. It has been found to be both a remedy and a prevention for colds, flu, all infections, and all fermentation due to any bacteria, fungus or virus, especially staph and strep, which are often found in diseased conditions. It has been reported to rapidly subdue inflammation and promote faster healing. The body needs Colloidal Silver to fight disease-causing organisms and to aid healing. Taken daily, Colloidal Silver acts as a second line of defense to assist your own immune system by helping the body fight against and become less susceptible to the above mentioned harmful organisms. This results in more energy, vigor and vitality, relaxation, faster healing and reduced bodily toxins. An artificial antibiotic kills, on an average, 6 different disease organisms. Colloidal Silver is known to kill over 650 disease organisms without any known harmful side effects or toxicity. One-celled life uses a different method of chemistry - oxygen metabolism. Single celled organisms use a common type of enzyme, or chemical lung, for their oxygen metabolism. Herein lies its weakness! The mere presence of Colloidal Silver near any virus, fungus or bacterium - any one celled, disease causing pathogen - will cripple the enzyme causing the pathogen to suffocate and die within six minutes without any effect on the surrounding tissue cells. Silver has benefitted mankind's health for thousands of years. In ancient Greece and Rome, people used silver containers to keep liquids fresh. American settlers traveling across the west often put a silver dollar in milk to delay it's spoiling. Around the turn of the century, doctors prescribed silver nitrate for stomach ulcers. It has been a common practice to put a few drops of a silver solution in newborn babies' eyes to kill the bacterial that causes blindness. A silver compound known as silver sulfadiazine has been used in 70% of the burn centers in the U.S. It also helps stop the herpes virus specifically. The uses of Colloidal Silver go on and on in medical journals. Note: It is not the silver in dental fillings that is harmful, but the mercury which is a deadly poison. Then, 60 to 70 years ago, the cost became prohibitive - about $100 per ounce in 1930 dollars. Colloidal Silver, as it is now produced, is a redevelopment of an earlier, more crude, product that was first used in the early 1900s. Now the quality is higher and the cost a fraction of that earlier product. According to the FDA, Colloidal Silver may continue to be marketed and used as it was originally intended. NSP's Colloidal Silver exceeds FDA recognized standards. Colloidal Silver has been successfully tested at the UCLA Medical Labs where it killed every virus on which it was tested. Dr. Bjorn Nordstrom of Sweden's Karolinska Institute has used silver in his cancer cure methods for many years. He records that he has successfully cured patients who had been diagnosed by other doctors as terminally ill. While studying regeneration of limbs, spinal cords and organs in the late 1970s, Robert O. Becker, M.D., author of The Body Electric, discovered that silver ions promote bone growth and kill surrounding bacteria. The March 1978 issue of Science Digest, in an article, "Our Mightiest Germ Fighter," reported: "Thanks to eye opening research, silver is emerging as a wonder of modern medicine. Resistant strains fail to develop. Moreover, silver is virtually non-toxic." The article ended with a quote by Dr. Harry Margraf, a biochemist and pioneering silver researcher who worked with the late Carl Moyer, M.D., chairman of Washington University's Department of Surgery in the 1970s: "Silver is the best all around germ fighter we have." Important Notice: No claims are made as to any specific benefits resulting from the use of Colloidal Silver. Information conveyed herein is based on records and research for your information only and is not meant to imply that you will experience similar benefits or results. We are not licensed medical practitioners. We are prohibited by law from diagnosing or prescribing. Our information is for educational purposes only. No statement should be taken as medical advice. * 1 (one) teaspoon three times daily for 7 days, children 1/4 to 1/2 of adult dosage. After 7 days, 1/2 of dosage. * Chronic cases: double to triple dosage. * Optimum dose may require more or less Colloidal Silver depending on the state of the immune system. Kinesiology or muscle testing is an effective way to determine dosage. (Remember, this is a pure, safe mineral element and you cannot overdose. There are no known side effects). * A few people may feel achy and sluggish on the 3rd or 4th day after they begin daily Colloidal Silver ingestion. This is called a healing crisis. When the body is sloughing off a great many entrenched toxins at one time, the elimination organs can become overloaded. A simple bowel cleanse and DRINKING LOTS OF EXTRA WATER will help the symptoms to not occur or to lessen rapidly. Your NSP distributor will be able to help you with a cleanse. Colloidal Silver can be applied directly to open wounds and sores to prevent or heal surface infections. A Q-tip makes a good applicator or you may put a few drops on a small band aid and wear over warts, cuts, abrasions or any open sore. Dab directly onto skin cancers, eczema, or such itchy areas, or for acne or mosquito bites. Atomizer: For nose/lung problems, spray into nose while inhaling. Eyes: Put a few drops in eyes each night before bed. It's safe in baby's eyes also. Douches/Colonics: Add 2 (two) teaspoons to pure water. To Purify Water: Add one ounce per gallon, shake well, wait six minutes and shake again; wait six minutes and drink. Digestive Aid: Taken with meals, it helps improve digestion and eliminate fermentation. Animals: Depending on the size of the animal, use a dropper to put Colloidal Silver down the throat or just put it in your pet's food or water. Parasite Infections: Consume Colloidal Silver consistently for many days as the amount of Colloidal Silver must be sufficient enough to both infiltrate your body and organs and to also kill the parasites which are much larger than the microscopic silver particles. Parasites reproduce by laying eggs; and these eggs have the same characteristics of the oxygen-metabolizing enzyme as the single celled organisms. These eggs cannot hatch when there is sufficient Colloidal Silver in the surrounding body tissues - they are killed within six minutes and then are eliminated by the immune system. Plants: For all bacterial, fungal and viral attacks on plants. Simply spray diluted silver on the leaves and add to soil water. Mix 1 (one) tablespoon per quart. Tests prove, due to the high absorption of silver in the small intestine, the friendly bacteria in the large intestines are not affected. To aid in this absorption we suggest that you do a cleanse of the bowel and a Marshmallow/Pepsin cleanse of the small intestine. Consult with your NSP distributer regarding these cleanses. All bacterial, viral and fungal organisms are killed within 6 minutes of contact. Higher silver content in the body causes faster and more frequent contact with these organisms. No disease causing organism can live in the presence of simple silver. The following is a partial list of the more than 650 conditions that Colloidal Silver has been successfully used against. Colloidal Silver is available from your Nature's Sunshine Products independent distributor. NSP's high quality Colloidal Silver stays in suspension; whereas, poor quality and higher concentrations separate and settle at the bottom. * Whereas in many cases there is validity to claims of greater benefits from high concentration, it is not so with Colloidal Silver, for which "less is more." * A 3-5 ppm (parts per million) concentration is effective without being wasteful. * For optimal utilization and maximum benefit 5 ppm is used. * Colloidal Silver is tasteless and odorless. * NSP's is safest on the market and is completely non-toxic. Please email or call me for more information on Colloidal Silver. I have used NSP Colloidal Silver for years as well as on my children and husband. We use it when it is appropriate. It is not in our daily regiment. We have no grey color and I am able to fight eye infections, ear infections, thrush, colds and flu. Placing 2 drops in the ears 2-3 times a day is very effective in stopping a flu or cold virus from multiplying and making us feel miserable, but it is best to be done as soon as the person starts to feel sick for faster recovery.